Nobody can ever forget the first time that they watched Star Wars. Aged only 6 years old, I clearly remember going to the cinema with my older cousin Mike to watch The Empire Strikes Back. It blew my mind. I was hooked. Luckily, Mike already had a few Star Wars toys, so we could immediately re-enact those epic battle scenes. Now I wanted my own collection of Star Wars toys. I used to regularly go to my local toy shop, Dentons in Witney, Oxfordshire and pour over the wall of Star Wars Figures on display. As you can imagine, now top of my Christmas wish list was the iconic Millennium Falcon ship. After The Return Of The Jedi was released in 1983 and my cousin, who was quite a few years older than me, started to grow out of playing with toys, I gladly inherited all of his Star Wars figures and ships. At my parent’s house, there must be an army of, yellowing, figures buried under the patio in the former sandpit/Sarlacc Pit where we used to play for hours and hours. As a designer, Star Wars has always been a major influence on my aesthetic taste. The design of Star Wars seems like an infinitely deep rabbit hole of superbly designed characters, clothes, creatures, planets, buildings and ships, which never seem to date. Some years later I also grew out of playing with toys, after discovering skateboarding, cycling and girls. I passed on some of my figures to my younger brother Nathan. But, the memory of selling my beloved Millennium Falcon for £5 at the local Car Boot sale, will forever haunt me. A couple of years ago, my wife, Helen came home with a bag full of old toy soldiers that somebody had given her. She asked me to have a quick look through it before she’d throw them away or give to the Charity shop. I opened the bag and staring right back at me buried amongst the green plastic army figures was Yak Face. A well known rarer Vintage Star Wars figure. What a find! This little old piece of vintage plastic was worth about £150. We could have just sold it. But no, instead it kick-started the inner-child within me and I decided to embark on a mission to buy every single vintage Star Wars figure that was released between 1977-1988. My adult brain reasoned that each purchase was a good investment as prices were on the rise due to the recent popularity of the new Star Wars films and the upcoming 40th Anniversary of the franchise. 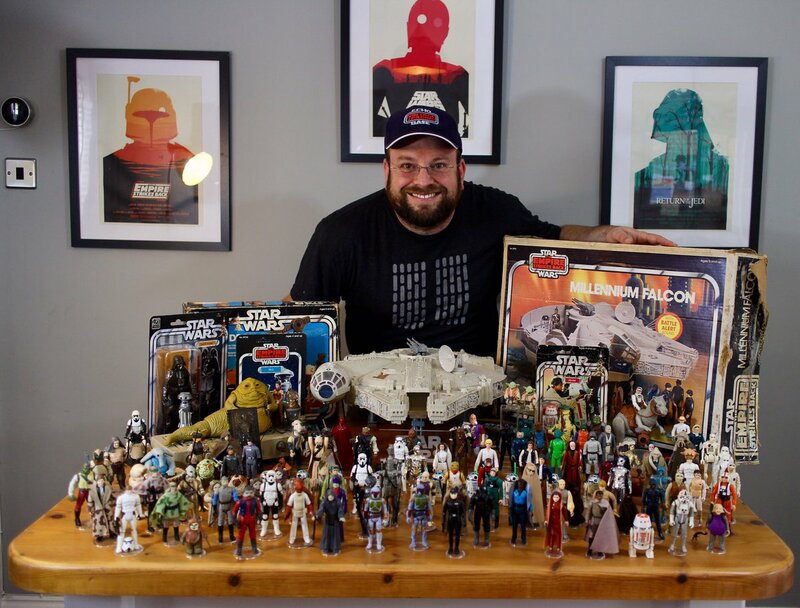 I stumbled upon a very addictive Facebook group called Echo Base UK, with a great community spirit, which enables collectors to trade vintage star wars toys, avoiding eBay fees and scams. Since then I have managed to collect the full complete set of 96 loose vintage figures, a couple of ships and two MOCs (Mint On Card) figures. I’m now starting to collect all the major variants, which have minor detail differences and can be harder to find and I have also developed a small R2D2 focus. I can’t tell you how much happiness collecting these vintage figures has brought me. I now eagerly await the postman/postwomen with my next delivery of plastic crack.